Here are details of deliverables for both South Tower and North Tower of Park Central Towers. Feel free to message us anytime might you have any queries. Visit our model furnished model units in our showrooms of our other projects located in Bonifacio High Street, Taguig and Greenbelt 5 in Ayala Center Makati, Glorietta Park Makati. We also offer preselling lots, premium office spaces, Golf Club Memberships, Country Club Memberships. Project locations: Ayala Center Makati, Ayala Center Cebu, Davao City, Morong Bataan, Porac, Pampanga, Nuvali Sta. Rosa Laguna, Calamba, Laguna, El Nido Palawan, Davao City. 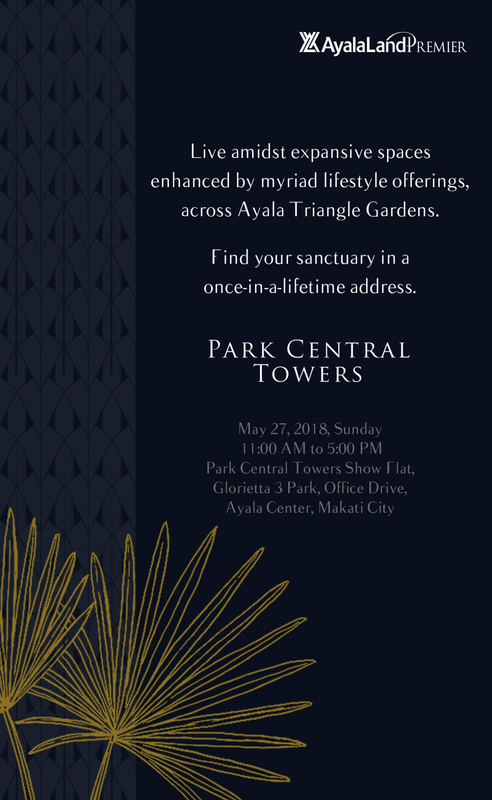 Ayala Land Premier will be having a very special event on the last Sunday of this month, May 27, 2018. The sales and marketing team will have an Open House for the Ultra Luxury project, Park Central Towers that will rise at the corner of Makati Avenue and Paseo de Roxas Makati. It is a furnished unit designed by Mr. Anton R. Mendoza. Be amazed of the high end turnover fixtures, spacious living area, modern gourmet kitchen, expansive ensuite bedrooms giving you a taste of the luxury of space in high rise cosmopolitan living. Event will start at 11AM – 5PM. We might have some buyer specials at the event which might involve freebies, flexible payment schemes and special discounts for cash and bulk buyers. Bring your friends and colleagues so we can share to them how great the project is as an investment. Might you have any queries or clarifications or questions, feel free to message me anytime. You may also visit my website and see other Ayala Land Premier projects. We have lots, townhouses and luxury condominium in the most prime location in the Philippines. There will be an across price increase on all Ayala Land Premier projects effective March 1, 2018. Enjoy huge savings by securing units before March 1. Share this great information to your friends and colleagues who wants to be a part of the Ayala Land Premier community.